The neighbourhood of Sarkhej in Ahmedabad was initially a village in the times of Ahmad Shah. The Sufi saint, Ganj Bakhsh Ahmad Khattu, decided to make his abode in Sarkhej, far from the busy streets of the new city of Ahmedabad. Sarkhej is a multiethnic cultural complex, borrowing from Hindu, Jain and Islamic influences. The famous tank is the epicentre of the whole complex but has dried up now. 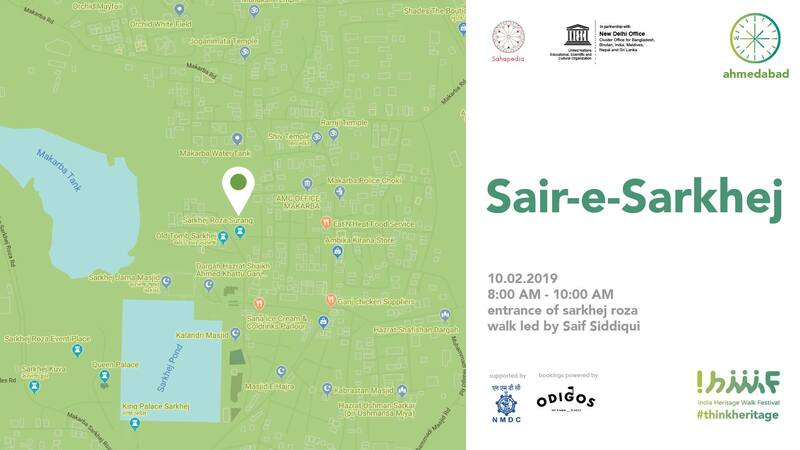 The walk will begin with the Queen’s Palace, following which we will visit the King’s Palace, Kalandri Masjid, the Roza, along with other mausoleums inside, the museum, and finally end with the Jama Masjid of Sarkhej. Parking facilities are available at the complex. Please wear comfortable shoes and carry drinking water and an umbrella or raincoat. As we will be visiting religious sites, please dress accordingly.